Abstract: According to literature references, Extracellular-Signal Regulated Kinase (ERK) signaling has been linked to memory and regulated by environmental stimuli. In Alzheimer’s disease, progressive cognitive impairment is seen as a classic characteristic. These deficits are believed to be the result of progressive synaptic dysfunction initiated by aggregated β–amyloid peptide 1-42 (Aβ). Zhu et al. (2002) showed that Aβ induced disruption of kinases critical for memory. In late stages of Alzheimer’s disease, ERK activation is suppressed relative to early stages and controls (Webster et al. 2006). In vitro studies have also shown that under certain conditions Aβ or fragments inhibit ERK or the downstream cAMPresponse element-binding protein (CREB) in neuronal cell models (Daniels et al. 2001). Here we evaluate the ability to detect changes in phosphorylation levels of ERK and CREB following treatment with Aβ using the SH-SY5Y neuroblastoma cell line. Aβ was oligomerized using a method previously described in the literature (FA et al. 2010). A two-step HTRFR assay process was incorporated such that cell plating and treatment are carried out in a 96-well clear-bottom imaging plate. Following lysis, aliquots were transferred to separate LV384-well assay plates to perform the phospho and total ERK and CREB assays. A neutralizing antibody was also tested for its capacity to counteract the inhibitory effects of Aβ. Aβ binding and antibody neutralization were detected via immunocytochemisty and microscopic analysis. All microplate reading and cellular imaging steps were performed using a novel cell imaging multi-mode reader. The combination provides an efficient, robust method for testing of new molecules to combat the degenerative effects of the disease. Summary: Here we evaluate the ability to detect changes in phosphorylation levels of ERK and CREB following treatment with Aβ using the SH-SY5Y neuroblastoma cell line.References: 1. 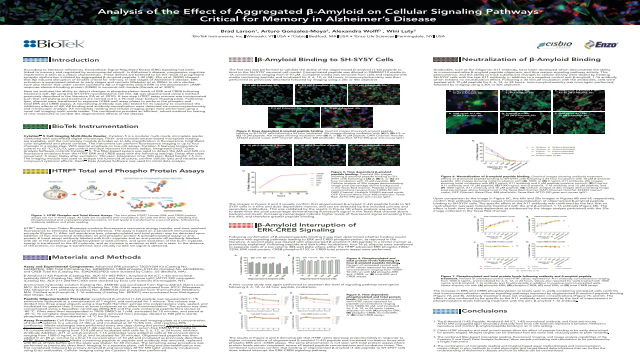 The β-Amyloid (1-42) Peptide, Amyloid β A4 (CT, 1-42) monoclonal antibody, and Goat anti-mouse ATTO 590 conjugated IgG1 secondary antibody from Enzo Life Sciences represent a sensitive method to reproduce and monitor β–amyloid peptide binding in an in vitro setting. 2. Cisbio HTRF phospho and total protein assays allow the effect of peptide binding to be easily determined for specific targets. Multiple targets can be assessed from the same well, reducing plate to plate variability.